Umicore is a prominent German precious metals refinery, and the company is responsible for manufacturing a number of silver products on behalf of foreign governments, in addition to their own line of gold and silver bars. 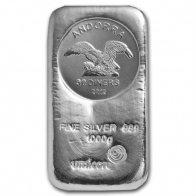 One of the most popular silver bars produced by Umicore is the 1 Kilogram Andorran silver coin bar. This item, although it is in the shape of a silver bar, has a legal tender value and also falls under the category of a coin. All Umicore silver bars contain a minimum of 999 fine investment grade silver bullion. Umicore silver bars are available for delivery or for VAT-exempt Swiss storage.